Each year, state lawmakers grapple with an array of major public policy issues that are subject to varying requirements for approval. This year, for example, lawmakers are considering whether to extend a tax break for companies that make movies or television series in California, a proposal that needs only a simple majority vote of the Legislature and the Governor’s signature to take effect. In contrast, current proposals to sell general obligation (GO) bonds to finance new dams require a two-thirds vote of the Legislature, the Governor’s signature, and voter approval. For the most part, the rules for approving legislative actions are set forth in California’s lengthy and complex state Constitution. In an effort to help Californians navigate these rules, we’ve put together a simple, easy-to-read table that illustrates the key steps for approving 18 legislative actions, from passing the budget to amending the Constitution itself. This guide shows that more than half of these actions require a two-thirds vote of the Legislature, most require the Governor’s signature, and a few need the consent of the voters. Tomorrow the Legislature will gavel in a special session — called by Governor Jerry Brown — on California’s rainy day fund. In convening this session, the Governor released details of his own rainy day fund proposal, which would restructure the state’s existing rainy day fund, the Budget Stabilization Account (BSA). An alternative proposal known as ACA 4 — a constitutional amendment approved by the Legislature in 2010 and subject to voter approval — is currently scheduled to appear on the statewide ballot in November. The Governor is asking the Legislature for the two-thirds vote needed to replace ACA 4 on the ballot with his rainy day fund proposal. If then approved by voters, the Governor’s approach would be codified in the state Constitution. As policymakers and others assess the Governor’s proposal, two basic questions are paramount: What problems are we trying to solve? And does the Governor’s approach successfully address them? The Governor has identified the central problem as California’s “boom and bust” approach to budgeting: the tendency during times of strong revenues to allocate all available funds — via tax cuts or spending commitments — rather than putting some funds aside for times of weaker revenues. The result is that periods of weaker revenues in California generally mean sizable budget shortfalls and, in turn, deep spending cuts. Wide fluctuations in state revenues are partly due to ups and downs in California’s economy, but they also result from how the state’s tax system is designed. California’s economy is characterized by a number of very-high-growth sectors that tend to expand rapidly during upswings, and the state’s tax system is structured to capture a share of this growth. This is done through higher personal income tax rates for wealthier earners as well as through taxes on capital gains and other types of income that increase during periods of economic growth. That the Governor proposes to address “boom and bust” budgeting by way of a rainy day fund is to his credit. This is because the chief alternative would be to reduce fluctuations in revenue by changing the state’s tax structure: specifically, taxing low- and middle-income Californians more and, in turn, sacrificing longer-term revenue growth by not effectively capturing economic gains. In other words, the alternative would involve making the revenue system less fair and less capable of providing sufficient support for essential public systems and services — outcomes that are both far worse than any that are likely to result from budgeting for the ups and downs of economic cycles. The key question in the upcoming special session is whether the Governor’s rainy day fund proposal amounts to a better mechanism — compared to the rainy day fund now in place and the model provided for in ACA 4 — for ensuring that California is positioned to withstand periods of decreased revenues without having to resort to deep cuts in public investment. The BSA — California’s current rainy day fund — was put into the state Constitution by voter approval of Proposition 58 in 2004. Proposition 58 requires that the state deposit 3 percent of General Fund revenues into the BSA each year — regardless of economic conditions — until the fund reaches certain thresholds. However, BSA deposits can be suspended or reduced in any given year by an executive order issued by the Governor — without approval from the Legislature — and there are no restrictions on how much of the funds can be withdrawn from the BSA in a given year. Deposits to the BSA have been suspended since 2008-09, and all BSA funds went to help cover budget shortfalls that emerged during the Great Recession. The Governor’s budget proposal for 2014-15 calls for a deposit to the BSA of $3.2 billion. ACA 4 would require that the state deposit 3 percent of General Fund revenues into a budget reserve each year. However, half of those revenues would be used to fund infrastructure or pay debt service on bonds and thus would not be available to help support state services during an economic downturn. In addition, ACA 4 would impose a cap on state spending that would, over time, severely limit the state’s ability to invest in services outside the Proposition 98 minimum school funding guarantee, including health care, higher education (CSU and UC), and assistance for seniors and people with disabilities. It would do this by establishing a complex method for identifying “unanticipated revenues,” with these revenues — subject to availability — first used to fund any required increase in the Proposition 98 guarantee and then used to further build the budget reserve, fund various obligations, and implement other policies, such as a one-time tax cut or a one-time boost in infrastructure spending. As a result, it is likely that spending for key public systems and services funded outside of Proposition 98 — including health and human services and CSU and UC — would decline as a share of the state budget, since relatively fewer General Fund dollars would be directed toward those services. Paying down debts and liabilities. The Governor’s rainy day fund proposal allows for making payments to cover certain budgetary debts and other liabilities — such as funding for the state’s retirement systems and unfunded obligations from prior fiscal years — instead of making the required rainy day fund deposits. This provision gives state policymakers the flexibility to retire existing debts instead of — or in addition to — saving for a rainy day. Placing limits on the amount of rainy day funds that may be withdrawn in the initial year of a downturn. The Governor’s proposal limits withdrawals from the rainy day fund to 50 percent of the total funds in the first year of a downturn in an effort to ensure that policymakers do not rely too heavily on the reserve at the outset of a recession as a means of bolstering the state budget. These are both notable improvements that would strengthen California’s budget reserve and its ability to help foster good fiscal management over the long term. Yet at the same time, there are certain provisions in the Governor’s proposal that raise concerns and merit special attention from legislators as they take up the Governor’s proposal in the special session. Deposits based on capital gains revenues. The Governor’s proposal bases rainy day fund deposits on General Fund revenues from capital gains — rather than on General Fund revenues overall, as in the current BSA — on the grounds that capital gains revenues are “the state’s most volatile source of revenue.” Specifically, the proposal requires that capital gains revenues that exceed 6.5 percent of total General Fund tax revenues in any year be deposited into the rainy day fund. Basing deposits on capital gains revenues sounds good in theory, but it presents serious challenges in practice. First, capital gains revenues are among the most difficult revenues to accurately estimate at a given point in time. The state typically is unable to provide an accurate accounting of capital gains revenues until a couple of years after the fact. As a result, rainy day fund deposits could be subject to significant corrections in later years. State leaders would have to “true up” prior years’ capital gains revenue estimates and make changes to prior years’ rainy day fund contributions — further complicating the state’s budget process. A second challenge is that the unpredictability of capital gains revenues may result in required deposits to the rainy day fund during periods immediately following a recession — at which point it might still be desirable to boost state spending rather than the state’s reserve. For instance, capital gains revenues recovered quickly following the end of the Great Recession, and by 2012-13 they significantly exceeded 6.5 percent of General Fund tax revenues. So, had the Governor’s proposal been in place during this period, capital gains deposits likely would have been required even though the state budget was still far from recovering from the impact of the recession. Fortunately, this challenge has an available fix: a provision could be added that would allow for deposits to be suspended until the state reaches certain thresholds that signal a post-recession recovery (for example, certain targets in tax collections and/or employment), an idea supported by experts on the design of state budget reserves. An increase in the maximum size of the rainy day fund to 10 percent. The Governor’s proposal increases the cap on the rainy day fund from 5 percent of General Fund revenues (under the current BSA) to 10 percent. While experts on strengthening rainy day funds support increases in the caps on rainy day funds, these same policy experts underscore that building back adequate funding for core public programs — such as education, health care, and other services that meet residents’ basic needs — should take precedence over deposits into the rainy day fund. California’s total General Fund revenues in the Governor’s proposed 2014-15 budget would be $106 billion. Consider a state budget cycle a few years into the future — with this 10 percent cap having been in place — that has General Fund revenues at a hypothetical $120 billion. A maxed-out rainy day fund would mean $12 billion set aside for a rainy day, juxtaposed against significant program needs across an array of state services that could potentially still be operating at diminished levels compared to where they were prior to the Great Recession. An effective rainy day fund, in contrast, would allow state policymakers some leeway in directing funds to public services and systems — in lieu of making deposits into the reserve — based on changes in caseload, persistent economic challenges, and other statewide and community needs. Creation of a separate rainy day fund for schools. The Governor’s proposal creates a separate reserve within the state’s General Fund for K-14 schools and community colleges, with the goal of making school spending more predictable. While making annual school revenues more predictable is a desirable goal, the formulas the Governor proposes to reach it would add greater complexity to the formula that the state uses to determine annual education spending. Moreover, our initial analysis suggests that deposits to the reserve for school spending would be rare and likely not to occur until at least the end of the decade. Restrictions on suspending or reducing deposits. The Governor’s proposal significantly restricts policymakers’ ability to suspend or reduce the required rainy day fund deposit. The deposit could be suspended or reduced if the Governor and the Legislature — by majority vote — agree to do so. However, the Governor first would have to declare a “budget emergency,” which is narrowly defined as (1) a disaster (natural or otherwise), (2) a “substantial” budget gap, or (3) insufficient revenues to provide “adequate” funding for most state services (those funded outside of Proposition 98) in the coming fiscal year. The Governor’s proposal defines “adequate” as spending equal to that in the current fiscal year adjusted for changes in inflation and population. In other words, if annual inflation is running at about 2 percent and the state’s population grows by well below 1 percent — California’s post-Great Recession conditions — state funding for most services could rise by less than 3 percent and still be considered “adequate,” even though far more funding may be needed to sufficiently reinvest in programs cut during an economic downturn. Under this scenario, unless the Governor could point to a disaster or a substantial budget shortfall, there would be no basis for declaring a “budget emergency,” and the required transfer from the General Fund to the rainy day fund would have to go forward, leaving fewer dollars to support public systems and services. In sum, while the Governor’s rainy day fund proposal includes some notable improvements, it also includes a number of provisions that raise questions about how the rainy day fund would operate — especially at times when the state is coming out of an economic downturn. The proposal includes provisions that add to the complexity of the state budget process, thereby increasing the likelihood of unintended consequences. Some key provisions in the Governor’s proposal, while well-intentioned in terms of sound fiscal stewardship, have the potential for requiring state leaders to put aside funds for a rainy day while the state is still struggling to recover from economic downturns and facing a significant need to reinvest in core public systems and services. With the special session soon getting underway, it’s important to underscore that policymakers have available a number of alternative paths forward — their choices aren’t limited to the current rainy day fund, the model under ACA 4, and the Governor’s proposal. Ultimately, while strengthening the state’s rainy day fund is a laudable objective, the state’s leaders should be careful to balance priorities — paying down debts and liabilities, saving for a rainy day, and ensuring that the state is positioned to adequately invest in programs and services that contribute to economic growth and broadly shared prosperity. New CBP Brief: Who Pays Taxes in California? 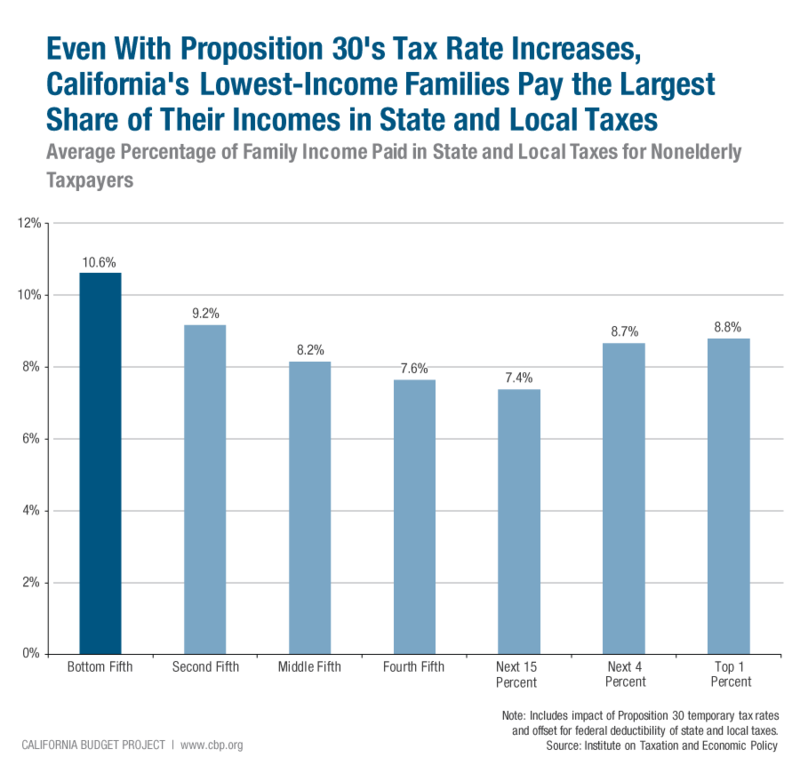 A new brief from the California Budget Project — released in advance of Tax Day — reports that California’s lowest-income households on average pay a greater share of their income in state and local taxes than other households. This is even after accounting for the temporary tax increases of Proposition 30 — approved in 2012 — which largely targeted very-high-income Californians. Using data provided by the Institute on Taxation and Economic Policy (ITEP), Who Pays Taxes in California? shows that nonelderly households in the state’s bottom fifth in terms of income, who earn $13,000 a year on average, pay 10.6 percent of their incomes in state and local taxes. This is a larger share than all other segments of households — including the very wealthy. The top 1 percent of Californians, with an average annual income of $1.6 million, pay just 8.8 percent of their incomes in state and local taxes — or nearly two full percentage points less than the state’s poorest families. Who Pays Taxes in California? examines how different components of California’s tax system — such as property taxes, sales taxes, and the personal income tax — affect lower- and higher-income Californians. The brief also suggests options for making California’s tax system fairer and promoting economic security for low-income families. Guide to California’s Tax System. In 2012, as states across the country continued to cope with the aftershocks of the Great Recession, California and Kansas pursued markedly different paths in tax policy. In Kansas, the state legislature in May 2012 passed — and Governor Brownback signed into law — a package of large tax cuts, including dropping the top income tax rate by approximately one-fourth and eliminating income taxes entirely on business profits that are “passed through” from businesses to their owners. In addition, the Kansas tax package raised the standard deduction and eliminated a number of tax credits that benefit low-income individuals and families. In contrast, California voters in November 2012 approved Proposition 30, increasing personal income tax rates on very-high-income Californians for seven years and raising the state’s sales tax rate by one-quarter cent for four years. The divergent paths pursued in California and Kansas provide an opportunity to compare state approaches to tax policy and the impacts of those policies on households, public systems and services, and economic performance. Large revenue losses: Kansas has seen an 8 percent decrease in revenues used to fund schools, health care, and other public services, with the revenue loss projected to rise to 16 percent over the next five years. Continuing cuts to schools: While most states are attempting to restore funding for schools after years of cuts, Kansas is proposing still more cuts. The Governor recently proposed another reduction in per-pupil general school aid for the next fiscal year that would leave funding 17 percent below pre-recession levels. Little evidence of improving economic performance: Since the tax cuts, Kansas has added jobs at a pace slower than the country as a whole. Large revenue gains: The state’s General Fund revenues increased from $85.6 billion in 2011-12 to an estimated $99.8 billion in 2013-14, and are projected to grow to $106.9 billion in Governor Brown’s proposed 2014-15 budget, an increase of nearly one-quarter (22.6 percent) since 2011-12. Increased funding for schools: The Governor’s 2014-15 spending proposal assumes a total funding level of $61.6 billion for schools and community colleges in 2014-15, nearly one-third (30.6 percent) more than in 2011-12. Improving economic performance: Since 2012, job growth in California has outpaced that of the US as a whole. To be clear, higher state revenues in California are a product of Proposition 30 and a recovering economy, just as slower economic growth in Kansas contributes, along with tax cuts, to lower state revenues. The linkages between tax policy changes and economic performance are, in general, weak. As the CBPP study reports, “states that cut taxes in the 1990s performed worse, on average, over the course of the next economic cycle than states that were more fiscally prudent. And the academic literature overwhelmingly finds that states with lower personal income taxes perform no better economically than their peers.” Recent experiences in California and Kansas support this evidence — increasing taxes in California did not curb economic growth, while decreasing taxes in Kansas did not boost economic growth. What is clear, however, is that large tax cuts in Kansas — most of which went to high-income households — have significantly reduced state revenues and resulted in cuts to the state’s schools and other public systems and services, while promises of economic improvement have failed to materialize. Meanwhile, in California, the revenues provided by Proposition 30 have provided the state with the fiscal policy space to boost school funding, pay down debts and liabilities, and begin to reinvest in other public structures and supports as the state’s economy recovers. Last week the Legislative Analyst’s Office (LAO) published an overview of the Local Control Funding Formula (LCFF), the fundamental restructuring of California’s K-12 education finance system. The report discusses the LCFF, details how it will provide additional dollars to disadvantaged students, and estimates how much it will cost to implement. In addition to establishing equity as a key principle for how the state funds schools, the LCFF sets a funding goal that could boost California’s per pupil spending closer — if not equal — to that of the rest of the US once the formula is fully implemented. California should aspire to a better per student spending ranking than the bottom 10, where the state has ranked for the past several years. As we’ve blogged about, California spends $2,500 less per student than the rest of the nation. To reach the same level of per student spending as the rest of the US, California would have needed to spend $15.3 billion more in 2012-13 than it did. While such a boost in funding might seem out of reach, it is actually a smaller increase than what the LAO estimates is needed to fully implement the LCFF. Specifically, for the LCFF to be fully implemented by 2020-21 — the goal established by the Governor and the Legislature — the LAO estimates that school funding would need to reach a level that is equal to an $18 billion increase in 2013-14 (above 2012-13 funding), not accounting for required cost-of-living adjustments. So even though the LCFF is not expected to be fully implemented for several years, policymakers should be commended for establishing a goal that calls for substantially increased state support for schools and could bring state spending per student closer to the level of the rest of the nation. Reaching this goal, however, depends on a serious long-term approach to increasing state revenue. For instance, such an approach would need to account for the fact that the tax increases from Proposition 30 will expire in 2018. And in a broader sense, a plan for significantly increasing revenues could be part of an ambitious, long-range vision for California. Whether the state will have sufficient revenues to fully implement the LCFF by 2020-21 is unclear. What is clear is that delaying LCFF implementation would perpetuate both California’s low ranking relative to other states and current funding inequities. The hiring tax credits, which comprised nearly 60 percent of the total cost of the EZ program, were poorly structured, allowing companies to claim the credits without actually creating new jobs. Since its inception, the California Budget Project has critiqued the structure, usage, and rising costs of the EZ program. We’ve consistently called for significant reforms to the program, including narrowing the hiring tax credits and zone designations to better ensure that the credits result in new job creation in economically distressed areas. Reform was a long time in coming, despite a body of evidence showing that the program failed to produce its intended outcomes at an increasingly high cost to the state. Creates a manufacturing equipment sales and use tax exemption for use within manufacturing and biotech industries. The exemption is available statewide, rather than just within certain geographic areas, helping reduce incentives for jurisdictions in California to compete against each other for businesses. The budget agreement also includes a number of provisions designed to enhance our ability to evaluate the performance of the credits. The new policy requires businesses to return money to the state if certain terms are not met, sets benchmarks to ensure small businesses benefit from the new incentives, and includes sunset dates for the credits. In short, the package of reforms more effectively targets job creation in the state’s most distressed areas and allows us to evaluate and revisit the programs over time based on performance. That’s a win, at long last, for Californians and California. Beyond EZ reform, we will be monitoring two issues in particular. First, while there is much to celebrate in the budget agreement, the package of reforms also includes the establishment of a business incentive fund, to be administered by the Governor’s “GO-Biz” office to retain and attract business in California. The Governor used the signing of the new package to comment on Texas Governor Rick Perry’s travels to California earlier in the year in an effort to attract businesses to Texas, saying, “Those fellas in Texas, watch out…California has some new tools.” The Governor’s remarks point to an underlying problem with the new business incentive fund, in that it could be used to engage in a zero-sum, state-to-state competition for business, rather than investing in new jobs overall. A critique of the prior EZ system was that it encouraged local jurisdictions in the state to compete for businesses and jobs, rather than creating new opportunities. The same critique can just as easily be applied to the new business incentive fund if it merely results in state-vs.-state gaming of the system. Further, it perpetuates myths that lower state taxes inevitably result in state economic growth and that business location decisions are influenced by tax credits — claims that are clearly not supported by research. Fortunately, the new fund is limited in size ($30 million in 2013-14) and is subject to the same evaluation and performance requirements noted above, but how the fund is used in the coming years is worth watching closely. Second, in the deliberations about EZ reform, local leaders opposing the reforms often noted that the elimination of Redevelopment Agencies (RDAs) in 2011 and restructuring of the EZ program would leave local governments with few available tools to promote local economic development and redevelopment. From our vantage point, RDAs and EZs were poorly structured to achieve these goals. But their elimination (RDAs) and reform (EZs) expose a significant gap in state and local economic development and redevelopment, particularly in terms of affordable housing. With EZ reform at long last a reality, it is time for state and local leaders to identify effective strategies and tools that position the state for growth and broadly shared prosperity. The budget signed by Governor Brown last month assumes that state revenues will total $137.0 billion in 2013-14. This consists of $97.1 billion in General Fund revenues — the primary source of funding for state services — and $39.9 billion in special fund revenues — proceeds of taxes, licenses, and fees that are designated by law for specific purposes. These estimates are remarkable for a couple of reasons. First, revenues as a percentage of the California economy in 2013-14 are projected to be roughly equal to the 40-year average, which is 7.5 percent. In other words, as a share of the state’s $1.8 trillion economy — as measured by state personal income — revenues in 2013-14 are expected to come in right around the historical trend line going back to 1974-75. This is notable because California voters approved two tax measures last November — Propositions 30 and 39 — that are projected to boost state revenues by about $7 billion in 2013-14. The fact that revenues are expected to be near the historical average in 2013-14 even with the new revenues approved by voters — rather than significantly above that average — highlights the deep hole that the Great Recession and years of tax cuts created in the state’s tax system, which Propositions 30 and 39 helped to fill. The 2013-14 revenue estimates are also remarkable for a second reason: Total projected revenues — $137.0 billion — are more than $20 billion below the level they likely would have reached if the Great Recession had not occurred, as we explained in a blog post earlier this year. In other words, if California’s economy hadn’t hit a steep downward slide in 2008 and instead had increased to $2.2 trillion by 2013 (as state analysts expected back in 2007), total state revenues likely would exceed $160 billion in 2013-14, based on revenues comprising 7.5 percent of the state’s economy. Instead, California’s smaller-than-expected $1.8 trillion economy is projected to generate less than $140 billion to support state services during the current fiscal year. This $20 billion-plus revenue gap represents dollars that are not available to support state investments in education, child care for working families, transportation, and other public systems and services that promote economic growth and broadly shared prosperity. Of course, it’s possible that revenues will surpass the level assumed in the 2013-14 budget. For one thing, lawmakers adopted the Governor’s relatively conservative General Fund revenue projection for 2013-14, which was $2.7 billion below the Legislative Analyst’s forecast. For another thing, the state finished 2012-13 — which ended on June 30 — with General Fund revenues running just over $2 billion (2.1 percent) ahead of the Governor’s May Revision forecast. Yet, even if total state revenues in 2013-14 come in a few billion dollars higher than anticipated, that larger amount would still be close to the historical average as a share of California’s economy (7.5 percent) and would remain far below the level that revenues likely would have reached but for the Great Recession. You are currently browsing the archives for the State Taxes category.